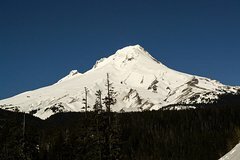 This tour shows you Mount Hood and the surrounding area. We start with a drive through the Columbia River Gorge with stop at Multnomah Falls. Your introduction to the Hood River Valley features a stop at Panorama Point, with a splendid view of the peak of Mt. Hood to the south and the summit of Mt. Adams to the north. Then we are off to Sahalie Falls and the White River Glacier viewpoint. With a climb to the 6,000 feet we reach the world-famous Timberline Lodge, a national historic landmark. Leisure time here allows for lunch (no host) and touring the Lodge, small Museum, and Visitors Center. Our Mount Hood & Hood River Valley Tour shows you Mount Hood and other Oregon’s crown jewels on a full day adventure. The morning departure includes a drive through the Columbia River Gorge National Scenic Area including a photo stop at Multnomah Falls. Your introduction to the Hood River Valley, world-famous for its pears, orchards and vineyards is a stop at Panorama Point. This natural promontory features a panoramic view of the peak of Mt. Hood to the south and the summit of Mt. Adams to the north, a sight you will never forget. Then we are off to Sahalie Falls and a photo stop featuring a restored bridge from the 1920s on the original highway to Mt. Hood. As we skirt the flanks of Mt. Hood, you will see outstanding views of the snow-clad summit, Oregon’s highest peak. A photo stop at White River Glacier viewpoint will illustrate the power of glaciers in shaping our mountain range. With a climb to the 6,000 feet we reach the world-famous Timberline Lodge, a national historic landmark completed in 1936 and one of the West’s iconic mountain lodges. Leisure time here allows for lunch (on your own), touring the lodge, and the forest service museum. There is time to enjoy a beverage in the Rams Head Lounge, a setting with spectacular views. The surroundings at Timberline feature views of the peak of Mt. Hood and the vastness of the Cascade Mountains, including Mt. Jefferson and other Oregon peaks in the distance. Our return trip opens up views not seen on our ascent and features a stop at one of the popular fruit stands featuring products from the Hood River Valley. Time at the Gorge White House, a historic landmark, allows tasting of local Oregon wines and other bounty (no host) and some moments to enjoy the surrounding orchards, vineyards, and gardens of flowers. As we return to Portland, you will have panoramic views of the Columbia River, the route of the Lewis and Clark expedition of 1804-1806, and many natural landmarks including Wind Mountain, Table Mountain, and Beacon Rock.